I immediately have a number of feelings about this show. The family seem happy in the flashbacks, but constantly bicker with one another in the present. While I know this is based on an older series, the constant bickering between family members can feel grating at times. I know it’s one of those situations where they all love one another regardless, but when their disagreements are the focus over the situation I can’t help but roll my eyes. Additionally, each member of the family seems to be brilliant in some regard or another. The Mum is an aerospace engineer, the eldest daughter is a qualified doctor, the younger daughter has a deep knowledge of literary history and the son has a high capacity for empathy and the deepest knowledge of geology. The Dad is an ex-marine and the brawn of the group that nobody else seems to like. I get tired of the estranged father trope, having to work his way back into the family fold throughout the series. Aside from being in the military for extended periods of time, it doesn’t seem like he deserved the crappy attitude everyone else gives him, despite the fact he seems to be doing his best. But whatever, I guess there is more to be revealed about him as the series goes on. The other famous characters of the original show are also introduced, the wildcard that is “Doctor Smith”, this time a woman, who steals the real Smith’s identity in order to escape the doomed starship. She is introduced through flashback and we don’t see her interact with the family. There’s also the robot that befriends the young Son, Will. The robot, it seems, was the cause of the destruction on the Starship Resolute and is why the family found themselves in the escape shuttle that got sucked into the wormhole. Which leads them to their current predicament. Though friendly now, his nature is one more twist in the upcoming tale. Where the show excels though, is in its visuals. 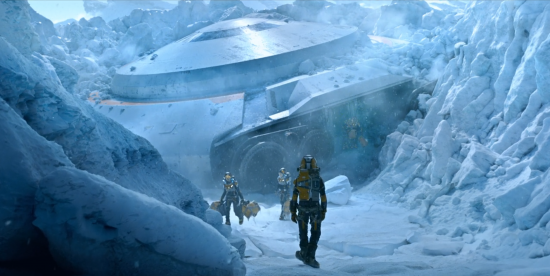 The snowy vistas and alien landscapes are given plenty of time through sweeping establishing shots. On top of that, the robot itself is a pretty impressive visual effect. The first episode threw minor problems at the family to establish their relationships, as they don’t stray very far from their crash site. As they begin to explore and meet other survivors I’m interested to see which problems and science fiction concepts they bring up as the series progresses. 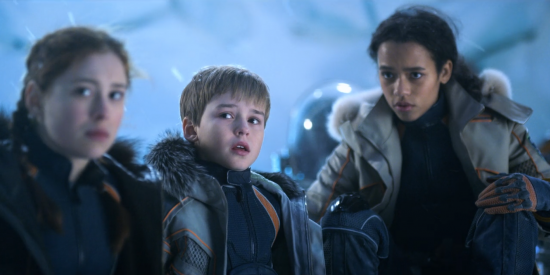 Posted on July 31, 2018 July 29, 2018 by WooderonPosted in Condensed Reviews:, NetflixTagged Danger, doctor smith, lost in space, mid week review, molly parker, Netflix, science fiction, Toby Stephens, Will Robinson.